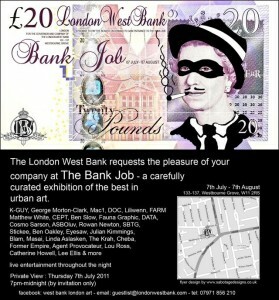 Last minute invite from the West Bank Gallery to be part of the Bank Job show, featuring many of the UKs finest urban artists. Including Grafik Warfares own Stickee, EyeSaw, ASBOLuv and little old me! Email guestlist@londonwestbank.com to get your name on the guest list or to request the show pdf.